Golf requires several pieces of equipment. Millions of people head to the links each weekend for a round of golf. This ranges from seasoned pros to rank amateurs, but not everyone knows what to bring. Forget about all of the ancillary things such as three kinds of chipping wedges, a meter gauge and a ball dispenser. A good golfer will bring the right amount of balls, tees and a good set of clubs because those are the essentials needed for a good round. For a round of golf, the average player wants to bring three woods--a driver, 3-wood and 5-wood--and a set of irons ranging from 2- through 9-irons. 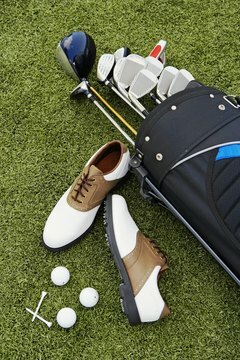 The golfer also will need a putter, a pitching wedge and a sand wedge. Carry the clubs in a lightweight bag that also has room for balls and tees. Bring about two dozen balls to the course. Make sure to know what kind you are hitting in case the ball goes into another fairway, woods or other hazard. It helps to mark the balls with a special logo such as filling in three dots with a marker. You also should bring a bag of wood tees. Wear a set of comfortable spikes. Most courses require soft spikes so the course does not get damaged. While some players debate their merits, most say a good pair of spikes improves a player's game.